We are not short of honeyeaters in Murray Bridge. 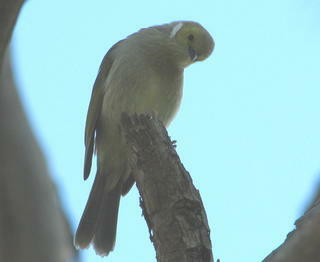 They are common everywhere in this district and are probably the most common bird in most people’s gardens. Other species may outnumber them along the river or in the farming areas. For example, Straw-Necked Ibis numbers along the dairying flats are very numerous. I have seen flocks of over 400 on many occasions. Flocks of Galahs of that size are also evident, especially where wheat is cultivated. Along the parks and trees lining the River Murray large flocks of Little Corella can also be seen on occasions. 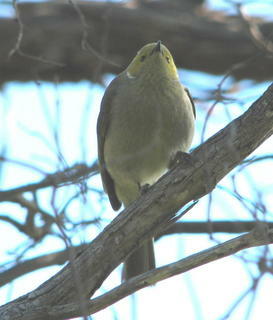 In the gardens, however, the honeyeater species tend to dominate. We do have some Noisy Miners in the area but they are not (yet) the dominent species they seem to be in other parts of Australia. In the Murray Bridge district New Holland Honeyeaters probably outnumber all other species of honeyeater. Red Wattlebirds are also very common as are White-Plumed Honeyeaters. Last Monday we went to visit my wife’s mother. She lives in a retirement village, Murraylands. Part of the complex opposite her unit is a plantation of native Australian plants, established 20 years ago and maintained by the local members of the Australian Plant Society. The local group is in recess due to lack of members, Corinne (my wife) is the immediate past-president and I am also a past-president. 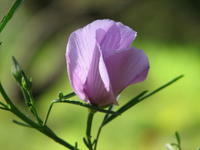 While Corinne was collecting cuttings for propogation I was taking photographs of various flowers for her. (I have included several photos at the end of this posting.) There were many birds in the locality, including a number of White Plumed Honeyeaters. Two of them came close to investigate what I was doing, so I took several photographs. I was basically shooting into the sun so the photos are not candidates for “Best of Show” in an exhibition. They turned out quite dark so I have enhanced them to show them here. I only include them here because of the unusual stance of the birds. The first photo (above) shows one bird looking straight down at me. The eyes are what caught my attention. It’s a rather bizarre view of a bird. The second photo shows the other bird’s response to the focussing beep on my camera. It obviously heard the soft beep as I focussed. Pity about the lack of colour. 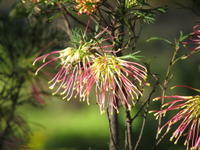 The native plant garden at Murraylands Homes is about an acre in size. 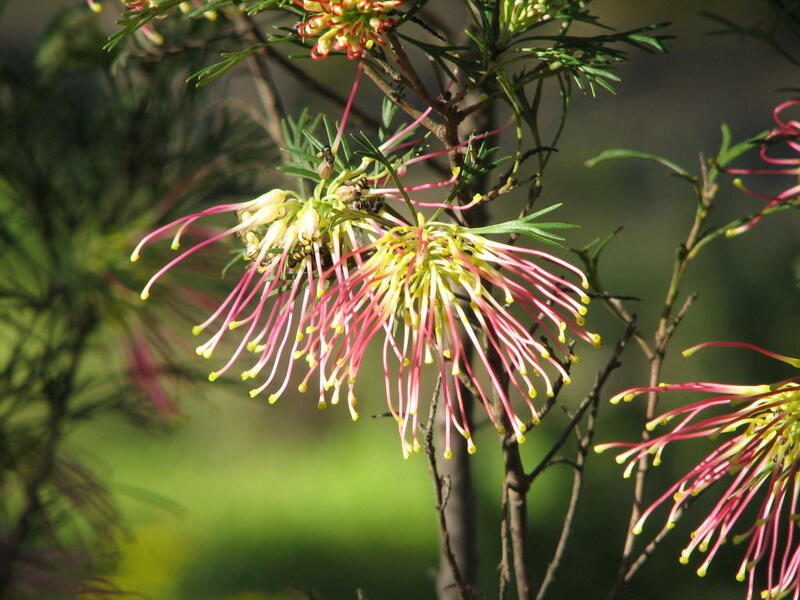 It includes a wide range of Australian plants, including eucalypts, wattles, grevilleas, correas, eremophilas, callistemons and many others. Below I have included a selection of the shots I took.